Get ready: Accessing U.S. law just got a little bit easier. This November, we’re proud to announce our collaboration in the newest release of LawLibe, a legal reference iOS application first developed by The Law Pod back in 2010. In its newest incarnation, LawLibe harnesses the power of the LII, putting Federal and State collections into the palm of your hand for quick and easy offline access. Started as an alternative to lugging paper versions of the Federal Rules to his law classes, Fitz Collings, founder of The Law Pod and a graduate of Cornell University’s College of Arts & Sciences, began developing legal reference web apps back in 2008. Seven years and 130 apps later, his work–combined with our legal collections–will condense into one affordable, mobile reference: LawLibe. Available for free download via the iTunes App Store, users can easily access the preloaded U.S. Constitution without an internet connection. Other legal reference materials like the U.S. Code, the Code of Federal Regulations and State Statutes can each be added for less than a dollar. Special features of the app include full-text search, in-text highlighting, visual preferences for ease of use, one-touch section navigation and Advisory Committee Notes. How and when did you first hear about the Legal Information Institute [LII]? How would you describe what it is? I first discovered LII during my first year in law school in 2008. I was taking civil procedure and, in addition to a hefty case book, I also had to use a fairly sizeable copy of the federal rules. After a couple days of carrying those back and forth to class, I thought there had to be a better way. So I googled “Federal Rules of Civil Procedure” and the first link that came up was to LII. I would describe the LII the same way now as that day I first came across it: the most efficient way to find out what the law is. Because of LII, I never had to bring my federal rules of civil procedure book to class again. And the experience of being able to quickly pull up and search through the rules on my computer was what got me interested in developing Law Pod. What is Law Pod, how does it work, and how did it come about? Law Pod is a collection of legal reference apps for iOS devices. It began in the fall of 2008 as a handful of web apps dedicated to the Federal Rules of Civil Procedure, Criminal Procedure, Appellate Procedure, Bankruptcy Procedure, and Evidence. The goal was to provide a replacement for the paper copies I had to lug to class, so I tried to design the web apps to display and search the content in each of these references at least as quickly as if I were using a book, and ideally much more so. But a 2008-era iPhone just didn’t run web apps well enough (or at all, if I didn’t have an internet connection) to make it a truly viable replacement. Fortunately, the iTunes App Store had just opened a few months earlier, so I set out to design a native version for the iPhone that wouldn’t require an internet connection. The native versions of the Federal Rules apps launched in the App Store in 2009, and were a huge improvement over the web apps. Apps for each of the titles of the United States Code and the Code of Federal Regulations followed, and later apps for New York and Texas state statutes, the Manual of Patent Examining Procedure, and historical legal references. All told, there are now about 130 such stand-alone Law Pod applications in the App Store. Our newest app condenses all of that content (and even more state law content) into a single app, called LawLibe. With LawLibe, you can download any or all of the legal references in the Law Pod library directly into the app. And you can access those references anytime, anywhere. It’s like having a law library in your pocket, and it will be the focus of our collaboration with LII. What motivated you to approach us with this idea for collaboration? What do you hope to achieve? While LII sparked the idea that would become Law Pod, Cornell University has always been very near and dear to my heart. For many years, I’ve been looking for a way to give back to Cornell as a way of saying thank you for everything that it’s given me. And when I thought back to the spark that LII provided to me at the beginning of my legal career, I saw an opportunity to engage with Cornell again in a meaningful and lasting way. My hope is that this collaboration with LII will allow me to stay involved with the University that has given me so much and help LII fulfill its mission to make the laws that govern us readily and widely accessible to all. As a consumer of our materials during your days as a student, and now as a practicing attorney, in what ways do you find the LII useful? LII offers exactly the amount of information I need as a practicing attorney in a fast and efficient layout, and it’s always up to date. As a student, or an attorney, or anyone who needs quick, reliable access to the current law, there really isn’t anything more useful. For what purposes and how often do you primarily use the LII? I use LII at least once a week, if not once a day. I generally use it as a starting point for legal research or to confirm the current language of the federal rules. In your eyes, how does the LII measure up against other legal resources in the market, and in what ways might we better serve our existing and future users? I think LII provides the most frictionless research experience of any legal resource on the web. I don’t have to log in or select a source. I just google “F R Civ P 26,” and LII is there to provide the answer I’m looking for. I would love to see LII extend that experience to state laws. You’ve studied biology, biotechnology and law. How did your interest in each subject begin and evolve, and in what ways do you apply your varied education today? I was interested in both biology and the law in high school, and I had two excellent teachers, Christine Breuker in biology and Jim Bunting in constitutional law, who cultivated that interest. At the time, though, I thought I would ultimately have to choose between the two. And I found that decision very difficult to make. I spent my first two years at Cornell with a focus on government and economics, and then spent the next two years majoring in and ultimately graduating with a degree in biology. As I later worked to earn my graduate degree, I wrestled with whether to pursue a career in science or to return to the law. It wasn’t until I began talking to friends in the legal profession that I learned that patent litigation might allow me to make a career out of the two subjects that I love. So I followed [my now wife] Nicole to law school to give it a try. I joined the law firm Sidley Austin in 2012, and I have used both my science and legal education every day since. Do you identify yourself as primarily a tech guy or as someone working in the field of law? 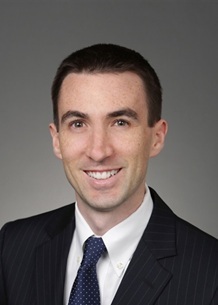 Fitz Collings, The Law Pod founder and practicing associate at Sidley Austin LLP, first released LawLibe, a legal reference iOS application, in 2010. I’m a practicing attorney first and foremost. What I realized early in my career, though, is that the legal profession can be slow to adopt new tech and, when it eventually does, it doesn’t always improve productivity or efficiency because there can be a gap in understanding between the companies providing the tech and the people consuming it. I try to use the insights I’ve gained from my own practice to develop applications that are truly useful to people both inside and outside the legal profession. Are you working on any other technical projects right now? My entire focus is on LawLibe at the moment. As we collaborate with LII to pull additional federal content into the app, we will look to expand the library further with more state law references and secondary legal content. In addition, we will be steadily adding features to the app to make it as useful as possible to the broadest possible audience. How has the landscape of the legal profession changed since you considered attending law school? Where do you think it is headed, and how well is the industry incorporating innovative technology? Since 2008, the legal profession seems to have become more streamlined, particularly with regard to use of technology. Discovery tools like predictive coding and analytics, for example, have vastly improved the process of combing through documents. And in highly technical fields like patent litigation, in particular, where whole cases can hinge on understanding complex technologies, I tend to see to the most early adopters. Not all recent technological advances dovetail well with the security and confidentiality demands of the profession, however, so I think it’s generally a good thing that the profession progresses methodically at a safe distance from the bleeding edge of innovation. How has entrepreneurship played a role in your career, and to whom or which organization(s) would you credit for your development. I think the hallmark of entrepreneurship is an innovative approach to problem solving. In my career, I’m often faced with projects that have immoveable deadlines and impossible scale. A one-size-fits-all approach simply doesn’t work in those situations. The ability to separate what matters from what doesn’t, formulate a plan, and execute it with complete ownership of the outcome is a skill worth developing in any profession, and the law is no different in that regard. It’s hard to pinpoint exactly where that developed for me, but I would certainly credit my family. Nicole has supported my endeavors from the very beginning and has been an indispensible sounding board for new ideas. My parents always encouraged me to think on my feet and gave me the tools to exercise independent judgment. And I have long looked to my grandparents, Charles and Marilyn, as role models. As fruit growers, they are perhaps the quintessential form of entrepreneur. Anyone who has worked on a farm knows that no day is ever the same—success in that environment depends on a combination of careful planning and the ability to adapt quickly to circumstances beyond control. Over the seasons I spent working with them at our family orchard in Ohio, they didn’t just teach me how to operate a business, they trusted me to solve problems I’d never encountered before. Their example and the lessons I learned alongside them have always served me well. Until our recent connection, how involved have you been with the LII? Why do you think it’s a cause worth supporting? Although I’ve stayed connected to Cornell since I graduated, this is my first involvement with LII. The worth of its cause—open access to the law—is so self-evident that it’s easy to overlook. As an undergraduate, I took a class simply named “Prisons” that was taught by Professor Mary Katzenstein and covered issues that are only now at the forefront of the news, such as mass incarceration and access to representation. One overarching point that the course taught me was that most people don’t know what the law is, or where to find it, or what to do with it once they’ve found it. LII does more than just about anyone to make the law instantly available, accessible, and understandable to anyone, and that is a public service whose value cannot be overestimated.